If you live anywhere in North or South Carolina, get your booty to Carolina Pottery this weekend! 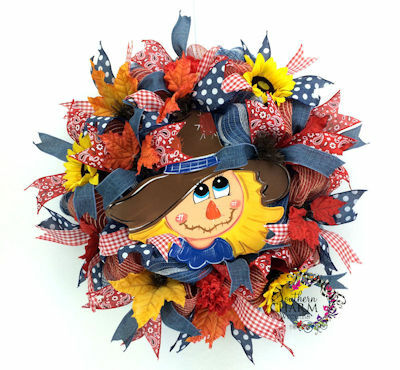 They have some of the best selections for your fall wreaths. I found ribbon galore…a ribbon addicts dream come true, no joke! They had tons of fall silk flowers, fall signs, pumpkins, work wreath forms, deco mesh and Halloween goodies too. So what did this freaky gal do? I took my iPhone into their store and filmed a Facebook Live video. You will see in the video, others thought I was a freak too! Bahaha! But before I get to the Carolina Pottery Fall Haul video, let me tell you a little about their customer service. This post contains some affiliate links for your convenience. Click here to read my full disclosure policy. 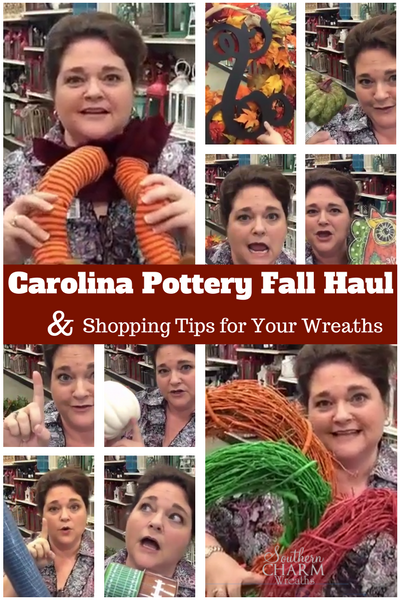 I heard stories from my ebook customers who say they would call and the awesome people at Carolina Pottery would spend 45 minutes or more helping them purchase over the phone. Say what? That’s is awesome. But some good news for you is that they now have shopping directly from their website. Whenever I’m in their store, the staff are always so willing to help search for items and eager to answer all my questions. Not to mention all the ideas I get from analyzing their beautiful premade wreaths. Also, if you have a tax exempt status for your creative business, just head to their customer service counter and create an account and you won’t have to pay sales tax. Take your car that has the biggest trunk for all the awesome stuff you will find at great prices. Bring your friends because the store is large and you may get distracted from all the items. Your friends will be there to keep you focused! Plus shopping with friends can spark more ideas. Don’t be afraid to use unusual colors for your fall wreaths. As you can see in the video, I suggest using a denim colored deco mesh, which produced this cute fall wreath below. Make sure to fluff your silk flowers and make them come to life before using them in your arrangements. 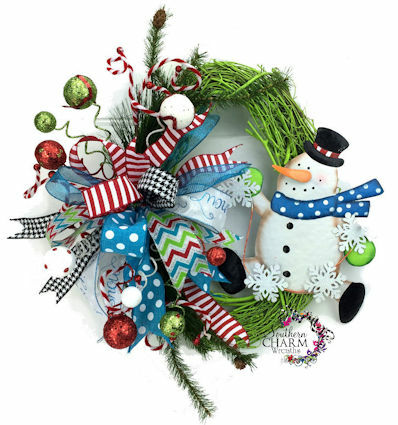 Don’t be afraid to purchase a premade wreath for your door, especially if you are just too dang busy. You can make it personal by adding a monogram sign on top of it. Purchase silk flowers in bushes that can be divided to save money. For metal signs, you can drill holes in the sign and use florist wire to attach to your arrangements. Click here for tools I recommend for wreath making. Girl, save yo self some time and do not paint your grapevine wreaths…well unless you just really like paint fumes. Time is money, and this will save you TONS of time. Also, since the painted wreath is so pretty, don’t cover up the whole thing, keep your wreath design so that half of the wreath is showing. You can see how I used a Carolina Pottery painted grapevine and sign in my Christmas wreath here. Here is my Facebook Live video.. MAKE SURE TO WATCH UNTIL THE END TO SEE A MINI WALKING TOUR. Comment below and tell me, how you liked the video. If you liked watching me shop, let me know where I should go next! Have you gone to Carolina Pottery yet? Love all your video’s,I don’t do face book,but I watch you on YouTube.I seen your old time poetry haul.it was so fun & exciting to watch.We have a old time pottery here in Columbus ohio. I also like all your wreaths and lantern swangs.Girl,You have the gift and it’s wonderful you share with the world. God less you &yours. I’m sorry I meant God Bless You &Yours..l have a question for you, How would you make a carrot nose for Christmas Wreath with out the big chenille stem? They stopped making those in orange,They have every other color but orange. Do you have any idles? ?Thanks Sandra k.
No, you’re not talking to yourself. Love you videos. lOVE THE VIDEO! HOW MUCH WERE THE PAINTED GRAPEVINE WREATHS? Bahaha, this made me chuckle “store police”! Love all your videos….Thank you for sharing!! God Bless!! ABSOLUTELY LOVE YOUR VIDEOS. YOU ARE SUCH A GREAT ENCOURAGEMENT TO ME AND OTHERS. KEEP WREATHING. Julie, I love your real time shopping videos!!! I have “nearly” mastered your funky bow! Thanks for your tutorials!! I enjoyed your video. Thanks for all the ideas! Love all your stuff..you found..wish I lived near you..? Thanks for the tour, I always wondered what the store looked like. You scored some great finds! The ribbon section is unbelievable, I too am addicted to ribbon, I just cannot have enough! I am new to watching your videos and I’m a avid wreath maker! I so wish we had a Carolina Pottery by me! I live in The Villages, FL and the store I shop at most is Hobby Lobby which is much more expensive and it’s about 45 minutes drive. I started making wreaths a little over 2 years ago and sell them at craft fairs and around the area that I live. Your videos are so helpful and I think your wreaths are beautiful. I would so love to win some of those goodies! This Friday evening I am lying in bed watching Shark Tank! Thanks for sharing your wreath making wisdom!